Black Jack centers around a uniquely skilled surgeon who’ll attempt to and eventually (successfully) resolve any proposed medical emergency ... for the right price. This particular movie focuses on a publicly unexpected explosion of talent by formerly milk-toast members of society involved in the fields of athleticism, art, and science, and Black Jack’s subsequent involvement as detective and savior in their rehabilitation in the midst of a medical and commercial conspiracy. Black Jack is hired to basically fix an unforeseen defect in the genetic engineering of “superhumans” and, in time, comes to realize that his employers are *gasp* the deviants behind the medical mystery. 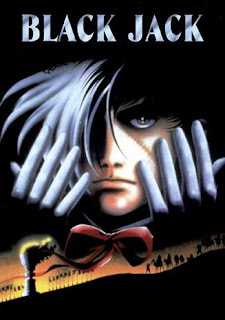 Although released in 1993, Black Jack (written and directed by Osamu Dezaki, Osamu Tezuka’s protégé) is beautiful in the way vinyl is authentic and 35 mm film should never be abandoned for digital. It’s a bit of a throwback in style and noir-ish in execution but remains very effective for the story told. Appropriately dominated by dark colors and lack of light, each frame, even those frozen in Dezaki’s characteristic “postcard memories,” infers a sense of haplessness, an underground mindset, and the uncertainty named boogeyman hiding beneath every young child’s bed. The movie works within a theme of capability vs. morality, which is formally and effectively portrayed by the main character’s non-existent Hippocratic oath, and examines three prevalent opinions: that of the optimist, the independent, and the corrupt. The optimist is wisely not the main character. Fantastically, it is the villain. She who hopes above all to push through a drug capable of advancing mankind but is so focused on the end that she does not concern herself with the means being undertaken in the process of getting there. In a likewise bit of genius, the corrupt is not the villain mentioned formerly, but the test subjects: ordinary people who volunteered to be artificially altered to obtain a greatness undeserved and who pay the ultimate price for their greed, either at their own hands or those of the addictive drug’s eventually mortal side-effects of fortune and fame. Black Jack falls nicely in-between, serving as a polished stainless steel scalpel reflecting both sides as he cuts away the infection. In such a position, Black Jack is free to perform the surgeries necessary to save lives while standing the moral ground of not being involved in an experiment. He’s got abundant natural talent but never lets it exceed his own purpose in life, which he regards with the determination of an uncompromised licensed physician. He exists as a neutral tool himself, tasked with the duty of doing whatever legally possible to save the life in his hands. Just because all three types of characters are complex doesn’t mean there isn’t fun to be had. There’s the hyper-energetic comedic relief of Pinoko, Black Jack’s sidekick, and allusions via her puzzles to Osamu Tezuka characters. There is also some decently dry humor sparsely threaded into some of the less tense moments of the movie. All things considered, Black Jack is a wonderful anime deserving of your indulgence. The art may look retro and the character designs may look a bit antique, but this is a labor of love by student for teacher that manages to retain many facets of his talented sweat. As long as you’re into well-rounded characters, distinctive visual storytelling, and an engaging (albeit predictable) plot, this movie is recommended to all adults. This review is based on a Netflix video stream paid for by the reviewer.